The fifth of the Red Carpet Catering mystery series starts off with a motorcycle chase, shootout, and even a chain fight. It’s just another day at work for actress Arlena Madison, the best friend and client of personal chef Penelope Sutherland. Yet the violence nearly pales in comparison to what was to be a genial brunch at their Glendale, New Jersey, neighborhood café. Arlena’s next movie role is to play a real-life professional tennis player of the 1940s and 50s, so Penelope had set up the meal to introduce the actress to an old high school friend. Nadia Westin is now a professional tennis player herself, and hopefully would be available to help Arlena train and mold herself into the role. Instead, their relaxing brunch is interrupted by a violent robbery where a family is attacked, Nadia injured, and her very valuable purse placed in police custody. It’s as good as time as any for them to leave for Vermont, where Arlena is filming the biopic based on the life of tennis-playing artist, Helen Willis. Penelope’s Red Carpet Catering company joins her to provide the casts’ meals, but they never expected that the two producers/directors would demand that their food be historically accurate to the 50s, environmentally-friendly, and locally sourced. Penelope isn’t sure what to think about the Svengali-like Jeremiah Truegood’s mandatory morning meditations or his growing influence over her new chef, or whether Nadia is having more than just a streak of bad luck. It makes being apart from her boyfriend Joseph Baglioni all that much harder, as the detective himself seems stymied by the robberies that are becoming more violent. The author excels in depicting the fascinating details that go on behind-the-scenes to produce such glamorous results. Penelope has learned to roll with the impractical and often whimsical demands of her artistic clients, but readers see the enormous amount of work required to make the results seem effortless. This is further reflected with both Arlena and Nadia, who face physical and mental tolls in order to be professionals in their respective fields. Social media certainly hasn’t made their tasks any easier, as while they can be inspirations and role models, they also face the onslaught of criticism and trolling. Readers who appreciate complex mysteries, mixed in with culinary and entertainment business details, will adore the latest in this always entertaining series. 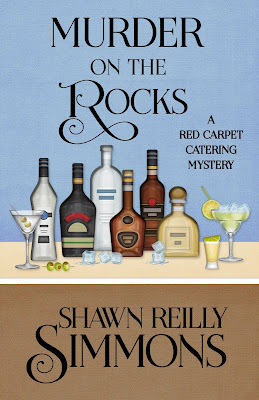 To enter to win a copy of Murder on the Rocks, simply email KRL at krlcontests@gmail[dot]com by replacing the [dot] with a period, and with the subject line “rocks,” or comment on this article. A winner will be chosen March 3, 2018. U.S. residents only. If entering via email please included your mailing address. If entering via comment please be sure to include your email address. So much happening in the book. Thrilling and exciting. Can't wait to read it. This looks like a great read! Thanks for a chance at the giveaway! Love the cover! New series to me. Would like to read.